Kyoto is particularly famous when it comes to the autumn-leaf viewing spots in Japan. You may be wondering which spot to go to as there are so many great autumn-leaf viewing spots in Kyoto. Let us show you some of the best must-go autumn-leaf viewing spots that we would like you consult with. Once you read this article further, you will be one autumn-leaf expert! At Shoren-in Monseki is illuminated in the evening during the autumn-leaf season. Although the autumn leaves in the daytime are splendid, this is somewhere you can enjoy in the evenings as well. You will be able to immerse yourself in a fantastic space which with blue LED lights. Kodai-ji Temple was built by a widow of a renowned feudal warlord in memory of him. There is a beautiful garden within the temple, and the beautiful contrast created by the temple and the trees with beautiful autumn leaves surrounding the pond is breathtaking. Entoku-in, the sub-temple of Kodai-ji Temple, offers you the view of beautifully illuminated autumn leaves along the cobbled pathway which is filled with atmosphere unique to Higashiyama, Kyoto. The site is so extensive and the view of the northern garden which can be viewed from Kita-shoin, which is located at the end of the tour route of the temple, is a must-see view as it is designated as a national site of scenic beauty. When you talk about famous temples in Kyoto, Kiyomizu-dera Temple is always on top of the list. Almost everyone sightseeing in Kyoto visits here at first as this is way too famous not to know about it. The temple offers the beautiful cherry blossoms in full bloom in the spring time, and temple-full of autumn leaves in the autumn. Hogon-in features a Japanese rock garden surrounded by a circular promenade, which changes its color to that of autumn leaves in the autumn and you can enjoy a very beautiful scenery offered by the garden. As the garden is illuminated in the evenings, it is also nice to take an evening autumn-leaf viewing. Tofuku-ji is famous for its maple tree referred to as Tsuten Momiji, and it is one of the best autumn-leaf viewing spots. The view of autumn leaves from the temple’s overhanging balcony is just beautiful. 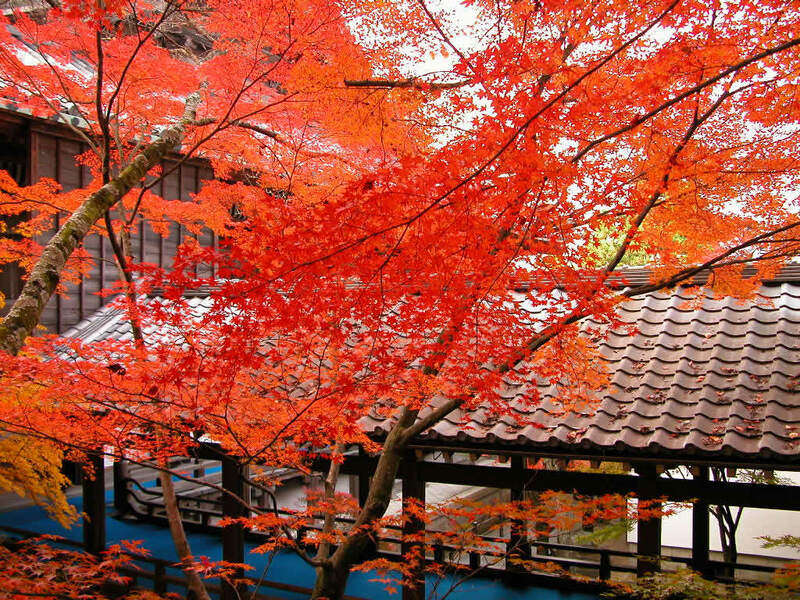 Eikan-do Temple is famous for its autumn leaves as it is referred to as the “Temple of Maple Leaves”. The entire temple site is filled with maple trees that it becomes covered by autumn leaves in the autumn. Nanzen-ji Temple is one of the most famous autumn-leaf viewing spots in Higashiyama, Kyoto. The scenery in which the maple trees planted within an extensive 45000-tsubo(37 acre) site change their color to red is a must-see scenery. The view of massive San-mon, one of the three greatest gates in japan, along with the autumn leaves is breathtakingly beautiful. This is one of the major autumn-leaf viewing spots in Kyoto which attracts many visitors. The area offers many places to enjoy autumn-leaf viewing, including Torokko (trolley) in Sagano Arashiyama, Togetsu-kyo Bridge, a famous garden “Sogenchi Garden” in a famous temple, Tenryu-ji Temple and so on. Hosen-in is famous for its “Gakubuchi Teien (picture frame garden)” which is viewed from reception hall. The contrast created by the autumn leaves from the garden and moss-covered garden is indescribably fantastic beauty. You can have maccha green tea and tea deserts at the reception hall during the daytime. This is the head shrine of Tenmangu shrines and Tenjinsha from all over Japan, the shrines dedicated to Sugawara-no Michizane, the patron god of scholars. The view of autumn leaves looking down the Kamiyagawa River from platform is so beautiful that it is highly recommended. Kyoto has too many famous autumn-leaf viewing spots to visit all in one day. You can enjoy viewing of beautiful autumn leaves wherever you go, so make sure to visit Kyoto this autumn-leaf season. The best autumn-leaf viewing spots in Kansai area that you definitely do not want to miss!